Indian cricket is having an amazing run in ODI cricket for close to two years now, as the team has performed brilliantly, losing just a single series in the last couple of years. The bowling line up looks extremely strong and they have been the main reason for the improved performances of the Indian team. The top-order of the Indian batting line up has been in terrific form since the 2015 World Cup and it has proved to be a huge asset for the Indian team. The all-rounders and the spinners too look good and have almost sealed their spots for the World Cup. If there is one area which could be a cause for concern, then it is the middle order. Kohli has tried a number of players in the No 4 slot with little success. 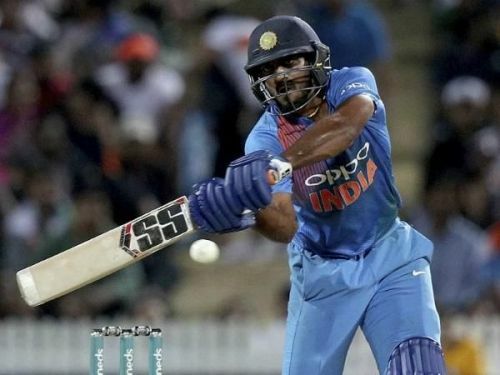 Indian team had zeroed in on Rayudu through the course of the last 4 months but his performance in the last two to three series has been below par. With a number of players waiting in the wings for an opportunity, Rayudu's dip in form has left the door wide open. Ajinkya Rahane is the only player in the list who has not played for India in limited overs cricket in the last one year but the class he possesses makes him worthy of a place here and the selectors as late as February have said that Rahane is still in the mix for a place in the World Cup squad. Rahane is a player who is most suited to perform the role of number 4 batsman as he is the kind of player who likes to rotate the strike but his performance before his exclusion from the team has not been satisfactory. Rahane has played 25 innings at number 4 for the Indian team and has scored 843 runs at an average of 37. His record looks impressive but he hasn't performed to the best of his abilities in international cricket in the recent past. Rahane is a talented player who is equally adept at playing both pace and spin. He might not be a great finisher but he has the ability to score runs in the middle overs which is the most important requirement of a number 4 batsman.